It is never fun to have a leaky roof, and finding an honest, reliable and competent person to repair it at a reasonable cost can be difficult. Many roofers in the Farmington Valley decline small repair jobs and will instead try to convince you an entirely new roof is needed. For quality installed roofs less than 20 – 25 years old, this is rarely the case. If your roofing system was installed by Brian – even 30 years ago when he was first starting out - you will be an automatic priority call for any roof repair. You can expect an immediate call back and priority service with no required minimum fee, no matter how small or big your repair need is. For roofs that were installed by other contractors, Brian has developed a business model for repairs to be fair to both the customer and his full-time employees. Our past and current customers with scheduled installations take priority. We will, however, fit in repair calls for new customers between existing scheduled jobs. For example, if we finish a scheduled installation of a new roof at 2pm, we may fill the rest of the day doing small repairs instead of starting the next contracted job. Unfortunately, this does make scheduling a ‘repair appointment’ nearly impossible since there are so many variables affecting a job’s end time. We want to be up front that we simply can not pull our crew members off in-process, contracted jobs to do small repairs. All new customer repair calls have a standard minimum charge. 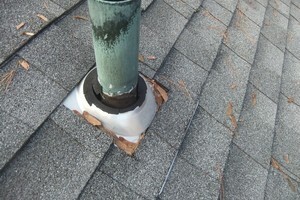 We do not provide estimates for repair work. Instead we listen to your needs and send a ‘repair order’ for your review and signature. We don’t like to surprise anyone, so the Repair Order does a good job of carefully spelling out our policies and procedures for approaching repairs. The standard minimum fee covers a diagnostic visit and labor up to 2 hours from the time leaving the office until the time leaving your job site. Any materials used are extra, but many small & simple repairs can be completed in this initial 2-hour window. While we will, upon request, provide a cost estimate following an initial inspection for more involved repairs, we do not provide a guaranteed price for repair work. 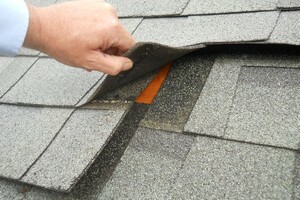 We charge for the labor time on a repair call and the materials used at no mark up. Finally, it is worth noting that if it is determined that your house should require a new roof, the technician can proceed to estimate the job. Your initial fee for the repair evaluation will be credited back if you choose us to replace your roof as long as actual repairs were not made. Our experienced roofers provide repair services such as leak detection and repair, repair or replacement of chimney and wall flashings and counter-flashings, shingle blow-offs or shingle slides, and replacing bath/kitchen fan vent boots. 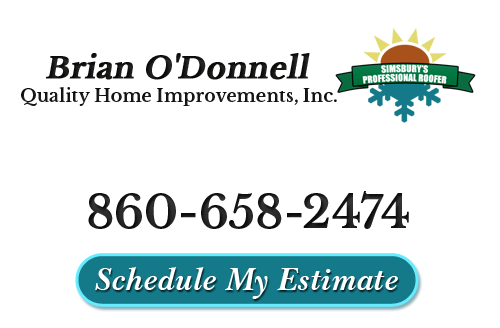 If your roof needs work, you can rely on your professional roofing contractor in Simsbury, CT at Brian O'Donnell Quality Home Improvements. If you are interested in speaking with us about your roof repair needs, please call our roofing contractors 860-658-2474 or complete our online request form.